Looking for a fresh and interesting primer for your supply and demand unit? 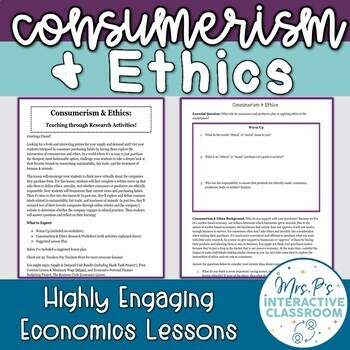 Get your students intrigued by consumer purchasing habits by having them explore the intersection of consumerism and ethics. In a world where it’s so easy to just purchase the cheapest, most fashionable option, challenge your students to take a deeper look at their favorite brands by researching sustainability, fair trade, and the treatment of humans & animals. This lesson will encourage your students to think more critically about the companies they purchase from. For this lesson, students will first complete a written warm up that asks them to define ethics, morality, and whether consumers or producers are ethically responsible. Next students will brainstorm their current views and purchasing habits. Then it’s time to dive into the research! In part one, they’ll explore and define common labels related to sustainability, fair trade, and treatment of animals. In part two, they’ll research two of their favorite companies through online articles and the company’s website to determine whether the company engages in ethical practices. Then students will answer questions and reflect on their learning!